Scottish Folds have distinctive ears, rounder face, large eyes and good natured personalities. They are a medium sized breed and can come in any color variation. Scottish Folds tend to be quieter and softer in their vocalizations than breeds such as Siamese. They also are affectionate and tend to be very loyal their people. They love to snuggle but that doesn’t keep them from clowning around. Scottish Folds are predisposed to some health diseases. The genetic gene mutation that results in the folded ears can cause other bone and cartilage disorders such as Osteochondrodysplasia. These diseases can result in painful joints, bone and cartilage malformations and arthritis. They can have polycystic kidney disease and cardiomyopathy. 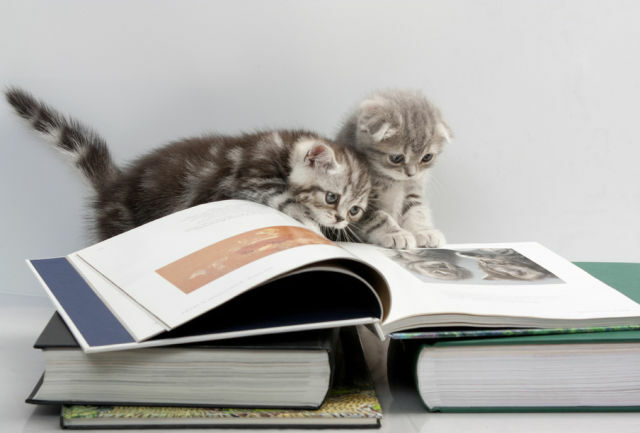 When selecting a kitten, research the breeder or owner, their breeding practices, and their animal husbandry. Ask about the health of their folds and see if you can visit their facility. The facility should be clean, free of any strong odors, and have no signs of overcrowding of animals. The queen should be in good health and of a normal weight. She should have a good temperament, be friendly, and sociable. It is important to observe the kittens as they interact in the litter. This can help you decide the personality of your kitten. A kitten should be playful and not reclusive or listless. During play they should neither be too timid or aggressive. A healthy kitten is full of curiosity and adventure. Like the queen, an emotionally sound kitten should be friendly and not hide when introduced to new people. Much emotional stability is developed while being part of a litter. Kittens should not be weaned from the mother before they are ready. Because of Scottish Folds medical predispositions you should take care to examine or have a veterinarian examine a kitten before purchase. The kitten should be a good weight and not too skinny or have a pot-bellied appearance. The coat should be clean, smooth, shiny and free of feces, excess oils, flakes or parasites. Eyes and nose should be clear with no signs of discharge or debris and no evidence of sneezing or coughing. There should be no redness or sores in the mouth, on the tongue, or on the lips. Their legs and back should be straight and there should be no signs of limping or lameness. Scottish Folds are great companions and would be an asset to any household. Good luck!